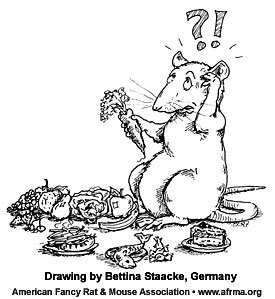 Q Maybe you can help me on some information about what rats need, because I want to make a perfect rat food. If you have an analyses, that will be a big help. I want to make something that is perfect for the rats. “Nutrition – Nutritionally adequate diets are readily available from commercial sources. These standard rations are quite satisfactory for most applications. However, for some types of experimentation there are factors, other than nutritional adequacy, which must be considered. The nutrient composition of diets and the contamination of feed components by mycotoxins, antibiotics, synthetic estrogens, heavy metals, and insecticides may have a profound impact on many studies. For instance, caloric intake and the percent of fat and protein in the diet of rats influence the incidence of neoplasia (Altman and Goodman, 1979). Similarly, various contaminants have an adverse effect on data from toxicologic, gerontological, and reproductive studies. Standard commercial diets are formulated from natural ingredients and will vary in nutrient composition on a batch-to-batch basis due to differences in type and quality of ingredients used. Commercial makers of rodent feeds take precautions to preclude the presence of contaminants in feeds, but only a few products have a defined profile of maximal levels of heavy metals, aflatoxins, chlorinated hydrocarbons, and organophosphates. For some investigative purposes, feeds formulated with refined ingredients (purified diets) or with chemically defined compounds are useful when control of nutrient concentrations is essential (National Research Council, 1978). These diets are, however, too expensive for general use. Rats are commonly fed ad libitum, and food intake will vary according to requirements for growth, gestation, and lactation. The nutritive requirements for the rat are listed in the table below. a From National Research Council (1978). b Adequate to support growth, gestation, and lactation; based on 90% dry matter. c Linoleic acid, 0.6% is required. e One-third to one-half can be supplied by L-tyrosine. f Mixture of glycine, L-alanine, and L-serine. g Vitamin A, 1 IU = 0.300 µg retinol, 0.344 µg retinyl acetate, 0.550 µg retinyl palmitate. Vitamin D, 1 IU = 0.025 µg ergocalciferol. Vitamin E, 1 IU = 1 mg DL-α-tocopheryl acetate.